IMGT/3Dstructure-DB  is part of IMGT®, the international ImMunoGeneTics information system®, the high-quality integrated information system specialized in immunoglobulins (IG), T cell receptors (TR), major histocompatibility complex (MHC) of human and other vertebrates species, immunoglobulin superfamily (IgSF), MHC superfamily (MhcSF) and related proteins of the immune system (RPI), created in 1989 by Marie-Paule Lefranc (Laboratoire d'ImmunoGénétique Moléculaire, LIGM, Université Montpellier II and CNRS) and on the Web since July 1995. IMGT/3Dstructure-DB is the IMGT three-dimensional (3D) structure database. In 2008, amino acid sequences from INN/WHO were entered in IMGT/2Dstructure-DB, a section of IMGT/3Dstructure-DB. They comprise those of monoclonal antibodies (IG, mAb) and fusion proteins for immune applications (FPIA). In 2010, amino acid sequences from Kabat were entered in IMGT/2Dstructure-DB. They comprise those of immunoglobulin superfamily sequences collected and manually culled from the scientific literature, especially the book "Sequences of proteins of immunological interest, Vol.I and II", U.S. Department of Health and Human Services, National Institute of Health. IMGT/3Dstructure-DB provides a unique expertised resource on IG, TR, MH and RPI with known 3D structures. Structural data are extracted from the Protein Data Bank PDB. The IMGT/3Dstructure-DB standardized information includes IMGT annotation on the sequences, 2D structures (IMGT Colliers de Perles) and 3D structures of IG, TR, MH, and RPI with known 3D structures which are available in IMGT/3Dstructure-DB cards [2-7]. Annotations are according to the IMGT Scientific chart rules based on the IMGT-ONTOLOGY concepts [8-10]. Three-dimensional structure analysis includes chain details and contact analysis at different levels (domain internal stability, domain/chain interface, residue) that are particularly relevant for immunological proteins like IG, TR and MH, as they interact specifically with a great number of molecules. Domain sequences are renumbered according to the IMGT unique numbering for V-DOMAIN and V-LIKE-DOMAIN , to the IMGT unique numbering for C-DOMAIN and C-LIKE-DOMAIN , and/or to the IMGT unique numbering for G-DOMAIN and G-LIKE-DOMAIN . Each IMGT/3Dstructure-DB card is associated to a coordinate flat file with IMGT renumbered residues. Screenshots are in blue rectangles and data processing details are in green rectangles. The screen captures have been updated, please note the text has not yet been updated. The IMGT/3Dstructure-DB Query page shows, at the top of the page, the status of the database (Current date, the total number of entries and its decomposition (PDB, INN) and the date of the last update) and at the bottom of the page, the last entries and the access to the IMGT tools (IMGT/DomainDisplay, IMGT/Collier-de-Perles, IMGT/DomainGapAlign, IMGT/DomainSuperimpose and IMGT/mAb-DB). The IMGT/3Dstructure-DB Query page allows six types of search, the possibility to align user's sequences against whole IMGT/3Dstructure-DB entries using FASTA and offers visualization choice for the results. The IMGT/3Dstructure-DB entry code (ID) is identical to the PDB code, INN code or PROTEIN code. PDB code is an alphanumeric code (Ex : 1ao7), INN code is a numeric code (Ex: 7637) while PROTEIN code is an alphanumeric code which lenght is equals to 6 (Ex : p00054). An AutoComplete behavior is available for this field. AutoComplete works in the following manner: as you type in the beginning of a PDB code previous entries are pulled from a storage area and you may elect to simply select one of these entries. By selecting an entry, you no longer have to input the string because AutoComplete finishes entering the string for you. IG, TR, MH or RPI protein name and, if present, ligand. An IMGT molecule name is either a name retrieved from the literature or a name modified by IMGT® or a name added by IMGT®. The search by IMGT molecule name is case insensitive. The query "%>%" will retrieve all protein mutants for which the amino acid change(s) are indicated with the signe '>' in the IMGT molecule name. Mutants: IMGT standardized names for the protein mutants (ex: mutants of Len and Rei) comprise amino acids changes described according to the IMGT description of mutations (IMGT Scientific chart). Particularities in protein designations: The designation 'Newm' is used, in IMGT/3Dstructure-DB (ID: 7fab) for the human IgG1 myeloma protein Fab (designated as 'New' in PDB). This IMGT® designation Newm avoids confusion with the human 'New' Bence Jones Protein, that has been sequenced before 'Newm' (Particularities in protein designations: Human immunoglobulins: New and Newm). This section allows users to search entries using the IMGT-ONTOLOGY concepts (IDENTIFICATION, DESCRIPTION, CLASSIFICATION and NUMEROTATION) for each type of IMGT entry. This kind of search uses linked select elements. Linked select elements are two or more selects, where choosing a value in one changes the available values in some of the rest. 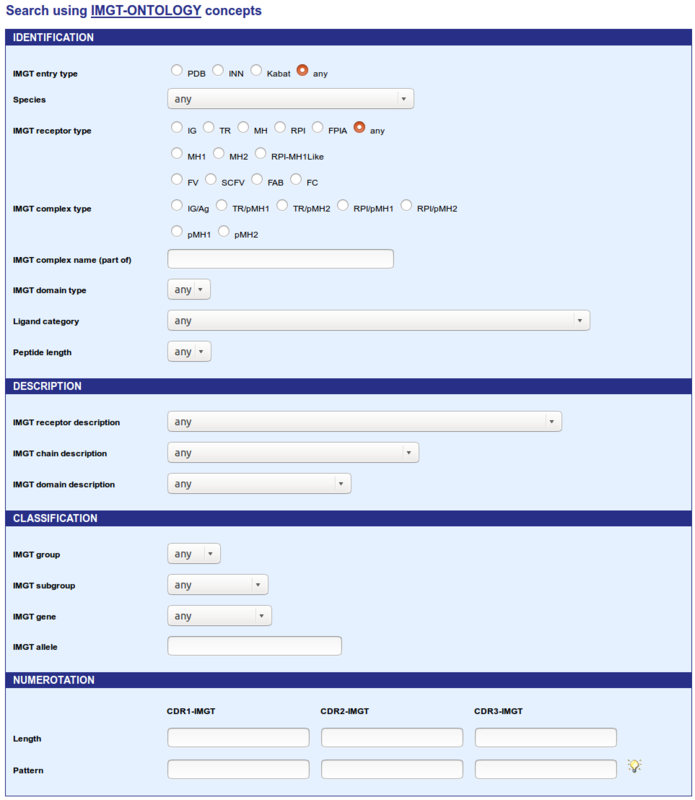 For example, selecting an IMGT receptor type will updates the 'IMGT receptor description' select to only contain receptor description from the IMGT receptor type selected. In the same way, selecting an IMGT group will updates the 'IMGT subgroup' select to only contain subgroup(s) from the IMGT group selected. Choose an IMGT entry type and then a: Species (also includes Camelized, Chimeric, Humanized, Caninized and Synthetic), IMGT receptor type (IG, TR, MH, RPI, FPIA or Any), IMGT receptor description, IMGT chain description, IMGT group, IMGT subgroup, IMGT gene or IMGT allele. A Chimeric receptor is one of which all chains are chimeric as a result of protein engineering. A chimeric chain is a chain that contains a foreign region (originating from one species other than human, or synthetic) linked to another region of different species. Note that the definition of a chimeric antibody is more precise. A Humanized receptor is one of which all chains are humanized as a result of protein engineering. A humanized chain is a chain in which a region is foreign (originating from one species other than human, or synthetic) whereas the remaining chain is of human origin. Note that the definition of a humanized antibody is more precise. 'Camelized', 'Chimeric', 'Humanized' and 'Synthetic' refer to both the receptor and to its chain(s). Options menus allows you to refine your research (MH1 and MH2 for IMGT receptor type; FV, SCFV, FAB, FC and RPI-MH1Like for IMGT receptor description). Search by Ligand category can retrieve structures which are in contacts with: Carbohydrate, Chemical compound, DNA, peptide, Protein or RNA. Search by Peptide length can retrieve structures which are in contacts with peptide(s) whose length is chosen in the drop-down list. IMGT receptor and chain description is based on the IMGT-ONTOLOGY DESCRIPTION concept. IG, TR, MH or RPI receptors and chains are described with standardized labels (listed in IMGT/PROTEIN-DB and IMGT/3Dstructure-DB: standardized keywords and labels for IG, TR and MH), and defined in the IMGT Scientific chart (IMGT/PROTEIN-DB and IMGT/3Dstructure-DB: Label definitions for IG, TR and MH). If the receptor is incomplete, the receptor label is replaced by domain or chain labels shown between parentheses. Group, subgroup, gene and allele names are based on the IMGT-ONTOLOGY CLASSIFICATION concept. IG and TR: V-GENE, D-GENE, J-GENE and C-GENE names are according to the IMGT gene nomenclature. Human and mouse IG and TR genes are from IMGT/GENE-DB. The D-GENE identification is not shown when it is too uncertain owing to the shortness of the D sequences in the V-D-J rearrangement, to N-region diversity and/or, for the IG, to somatic hypermutations. MH: The closest gene(s) is (are) provided for the rodent MH. IG and TR: The closest allele(s) is (are) provided for each gene. 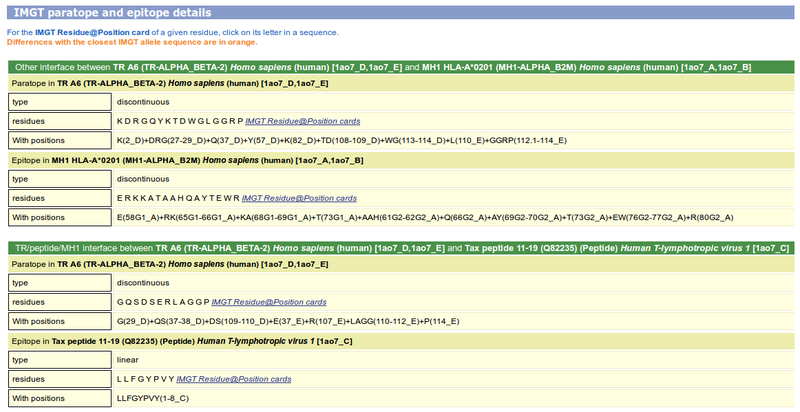 Human and mouse alleles are from IMGT/GENE-DB. Alleles are displayed in IMGT Alignments of alleles and IMGT/DomainDisplay. MH: The closest allele(s) is (are) provided for the human MH (HLA). A complex query can be performed. It is made up of a list of structural criteria coordinated by parentheses and boolean operator (AND and OR). group=TRAV AND length(CDR3)=13 Will query for IMGT/3Dstructure-DB entries which contain domain sequences from the TRAV group and a CDR3-IMGT of 13 amino acids. length(CDR1)=8 AND aa(29V)=V Will query IMGT/3Dstructure-DB entries which contain domain sequences with a CDR1-IMGT of 8 amino acids AND with, at position 29 of the V type domain (29V), a valine (=V). Resolution. Six value ranges are available: 0 - 1.00 Å, 1.01 - 2.00 Å, 2.01 - 3.00 Å, 3.01 - 4.00 Å, 4.01 - 5.00 Å and 5.01 - 6.00 Å. Release date. Choose the year of the PDB's release. Experimental method. Choose among 9 experimental methods: Electron microscopy, NMR, NMR, 18 structures, NMR, 20 structures, solution scattering, solution scattering, theoretical model, theoretical model, X-ray diffraction or X-ray diffraction, single crystal. This kind of search uses linked select elements. For example, selecting an author will updates the 'Journal' select to only contain Journal(s) from the author selected. At the top of the IMGT/3Dstructure-DB Query page, the user can choose to view the results as "Overview" or "Domain and sequence alignment". These two choices will display a list of IMGT/3Dstructure-DB entries or a list of chains respectively. .
An additional choice, "Reference view" is available at the bottom of the IMGT/3Dstructure-DB Reference query page. The result presentation depends on the visualization choice made at the IMGT/3Dstructure-DB Query page. On top of each result page, the visualization choice and the query are recalled, and the number of results is shown. For results which correspond to a list of chains (and not to a list of entries) it is recalled, between parentheses, that the number of results correspond to the 'number of chains containing the selected domain or region'. An additional result presentation corresponds to 'References'. The list of results is sorted by ID (entry or chain). The 'Overview' results provide a list of Entries. IMGT entry ID. Clicking on the entry ID gives access to the IMGT/3Dstructure-DB card. Species. The chain species (includes Camelized, Chimeric, Humanized and Synthetic. It may therefore be different from gene species, for example a chimeric chain may have Homo sapiens and Mus musculus genes). Ligand(s). Include ligands and, by extension, proteins other than IG, TR, MH or RPI. Experimental technique. X-ray diffraction, NMR, theoretical model. Resolution. Resolution of X-ray diffraction in angstrom (Å). PDB release date. Release date in the Protein Data Bank. The 'Domain type sequences' results provide a list of chains containing the selected domain type. chain ID. Clicking on the chain ID gives access to the corresponding IMGT/3Dstructure-DB card. 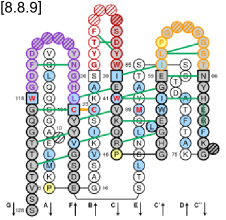 Amino acid sequences. Sequences of the domain type, with gaps and amino acid positions according to the IMGT unique numbering. 'Reference view' is only available from the IMGT/3Dstructure-DB Reference query page. It displays the following fields for bibliographical references extracted from the coordinate file: IMGT entry ID, Authors (PDB), Title (PDB), Year (PDB), Authors (PubMed), Title (PubMed) and Year (PubMed). Clicking on the IMGT entry ID gives access to the IMGT/3Dstructure-DB card. The 'IMGT/3Dstructure-DB card' is the core unit of IMGT/3Dstructure-DB. Indeed, there is one card per IMGT/3Dstructure-DB entry and this card provides access to all data related to that entry. Receptor type: IG, TR, MH or RPI. IMGT receptor description: IG, TR, MH or RPI IMGT receptor description (see IMGT receptor description rules) and, for other molecules: Amino acid, Carbohydrate, Chemical compound, DNA, Ion, Peptide, Protein or RNA. Ligand(s): Ligand or protein name (protein other than IG, TR, MH or RPI). Species: Species (including Camelized, Chimeric, Humanized and Synthetic). Latin names are written in italic. Crystallographic complex (CC): Proteins are identified as belonging to the same crystallographic complex (CC) when two of their chains have at least 15 amino acid contacts or if one of the chains in contact is less than 20 residue long. A manual expertise is also sometimes required. IMGT chain ID: A chain identifiant comprises the ID code, an underscore and the chain letter. IMGT receptor description : IG, TR, MH or RPI IMGT receptor description (see IMGT receptor description rules) and, for other molecules: Amino acid, Carbohydrate, Chemical compound, DNA, Ion, Peptide, Protein or RNA. Chains belong to the same protein quaternary structure when they are of the same type (IG, TR, MH or else), their amino acid sequence length is of the same order (no peptide with huge protein) and have at least 60 amino acids contacts and eventually a covalent link (as identified by the coordinate file). A manual expertise is sometimes required to correct errors created by these very simple rules and in some intricate cases. Contact analysis. Access to the IMGT/3Dstructure-DB Domain contacts (overview) for this coordinate file. Only available for PDB entries. 3D Visualization. JMol or QuickPDB. Only available for PDB entries. Renumbered IMGT file. Access to the renumbered coordinate file according to the IMGT unique numbering. The "download" link directly downloads the renumbered IMGT file (in gzip format). INN definitions and properties. Contains English, French and Spanish definitions, physico-chemical properties, Proposed and Recommended lists. Only available for INN entries. IMGT numbering comparison. Comparison of the residue numbering in the IMGT file and the PDB file. The Results from 'Paratope and epitope', 'Chain details' and 'Contact analysis' are detailed in the next sections. The 'Chain details' comprise information first on the chain itself, then per domain. The 'Chain details' section also gives information on associated ions and/or molecules that include ions, water and chemical molecules other than proteins or nucleic acids. Chain ID: Note that chain identifiant can be different in IMGT file compared to PDB file to correct misassignment. IMGT chain description: Chains are described with standardized IMGT labels (listed in IMGT standardized keywords and labels for IG, TR and MH for proteins and 3D structures). The different domains and their position in the chain are also represented. 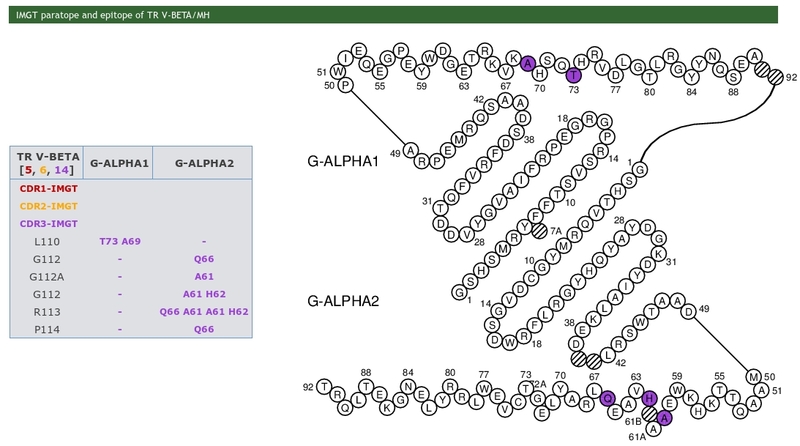 Chain sequence: The chain sequence is an amino acid sequence created by comparing the sequence of the primary sequence section (SEQREF) and of the atom coordinate section (ATOM) of the PDB file. A mask is also created, to inform if the residue is present, or not, or different in the sequence of the atom coordinate section. Residues not present in the atom coordinate section (ATOM) are writen in italic. Residues other than amino acids are indicated with their three code letters enclosed in parentheses. Amino acid differences with the closest IMGT allele sequence, shown in orange (these amino acid changes are identified by the IMGT/DomainGapAlign tool, integrated in IMGT/3Dstructure-DB and IMGT/2Dstructure-DB). blue color for the regions (e.g., HINGE-REGION) and domains (e.g., C-KAPPA, C-LAMBDA, CH1, CH2, CH3) of the IG and TR C-REGION. This is according to Color menu for regions and domains. The '(N-D)-REGION' is arbitraly delimited by the lengths of the untrimmed germline V-REGION and J-REGION. If nucleotide sequences are available, it is recommended to use IMGT/V-QUEST for an accurate delimitation and analysis of the junction. 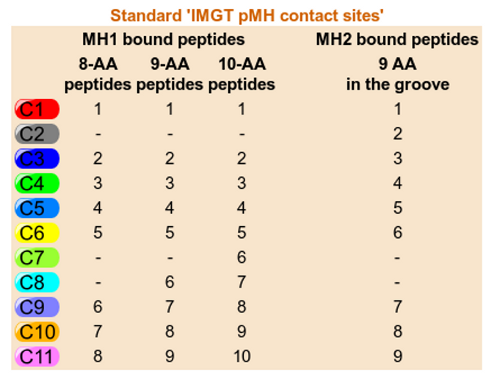 Contact sites (pMH only): IMGT pMH contact sites provide IMGT Collier de Perles for G-DOMAIN with identification of the eleven IMGT contact sites for the standardized analysis of the peptide/MH contacts 7. IMGT domain description: Domains are described with standardized IMGT labels (listed in IMGT standardized keywords and labels for IG, TR and MH for proteins and 3D structures). IMGT gene and allele name: The 'Alignment details' link allows to view the results of the allele identification alignments. 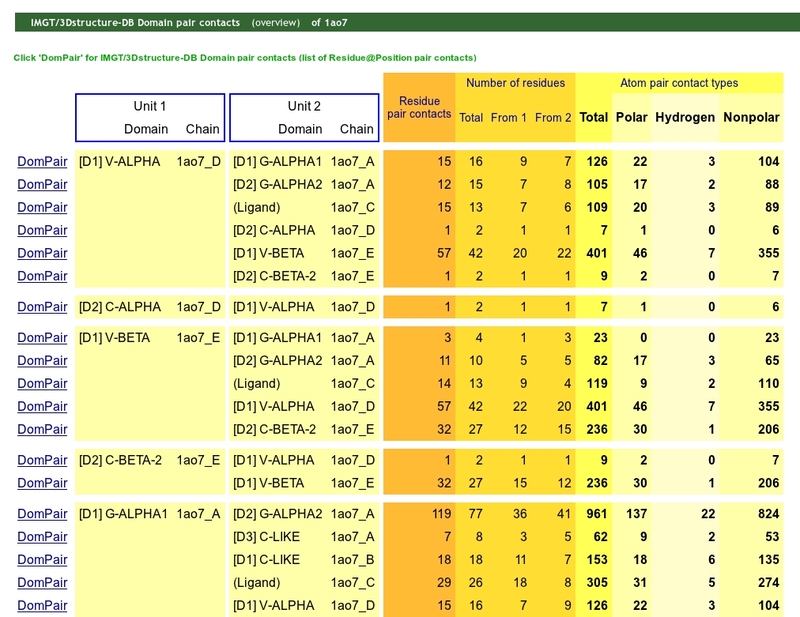 Eventually a 'Others' link appeared to show alleles that give the same alignment score for this domain, but a different score for the other domains (see above Gene and Allele). Consistency between alleles regions of the same chain is taken into account through the field consensus. Indeed several alleles may correspond to the same region but some of these alleles may not be consistent with the alleles in other regions. For example, alleles identified for different DOMAINs of a REGION must be identical. 2D representation: 2D representation (Provides a link to 'IMGT Colliers de Perles' for V and C type domains, to IMGT Colliers de Perles on 2 layers, see 3.2.4 IMGT Colliers de Perles). Contact analysis: Contact analysis provides a link to Domain contacts (overview). CDR-IMGT lengths: CDR-IMGT lengths (only for V-DOMAIN and V-LIKE-DOMAIN) are given between brackets. Sheet composition: Beta strands of the two sheets (only for V and C type domains) are given between brackets. IMGT/DomainGapAlign results: A link to the IMGT/DomainGapAlign results is provided per domain. The results of IMGT/DomainGapAlign are identical to those displayed in the IMGT/2Dstructure-DB or IMGT/3Dstructure-DB card (with the indicated species, for example humanized sequences are run against Homo sapiens (human) V gene). It is possible to obtain IMGT/DomainGapAlign results, by comparison to a different species or to 'Any species'. In the Standard parameters and sequences section at the top of the page, click a selection in the Species list (for example, 'any' for 'Any species'), and then click on 'Align and IMGT-gap my sequences'. IMGT Colliers de Perles are 2D graphical representation of the domains based on the IMGT unique numbering. IMGT Colliers de Perles are provided for V, C and G type domains. For the V and C type domains, they represent the immunoglobulin fold topology. 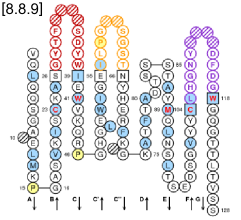 Loops anchors are shown in square, highly conserved amino acids at a position are in red and hydrophobic positions found as hydrophobic in more than 80% such domain sequences are in blue. 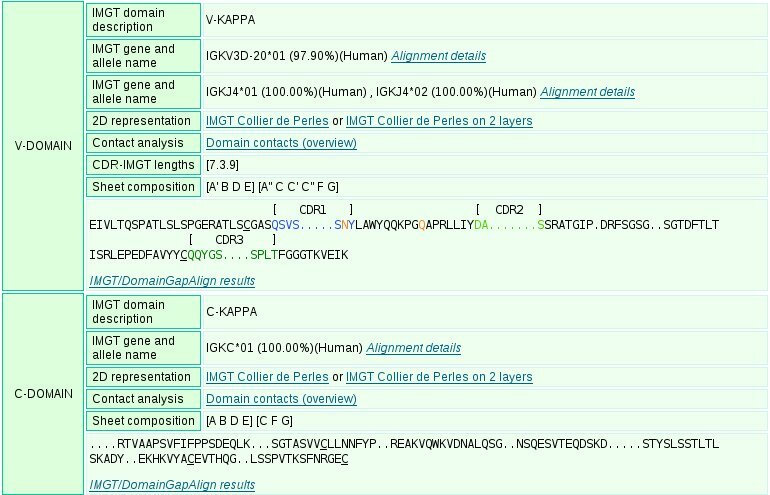 For the V type domains the CDR-IMGT lengths are written at the top of the page between brackets and they are colored according to the IMGT Scientific chart. In IMGT Colliers de Perles on 2 layers, hydrogen bonds are shown on the front layer, back layer and between the 2 layers. Clicking on the residue in the IMGT Colliers de Perles gives access to The "IMGT/3Dstructure-DB Residue@Position" card. Code: Three or two letters code. Nb: Number of ions or molecules associated to the chains. Name: Name of the ion or molecule, from the PDB Chemical Component Dictionary. Formula: Formula of the ion or molecule, from the PDB Chemical Component Dictionary. Note that ions and/or molecules are individualized in IMGT when they are included by error in the PDB chain definition. Although carbohydrates are usually linked covalently to the amino acid chains, they are considered separately as a carbohydrate chain from the amino acid chain in the IMGT/3Dstructure-DB card. IMGT chain ID is assigned to molecules of particular interest (for example inorganic antigene, heme molecule, etc.). This allows to distinguish these molecules from solvant and ions and to view them in the IMGT/3Dstructure-DB card summary table and in the IMGT/3Dstructure-DB contact analysis cards. 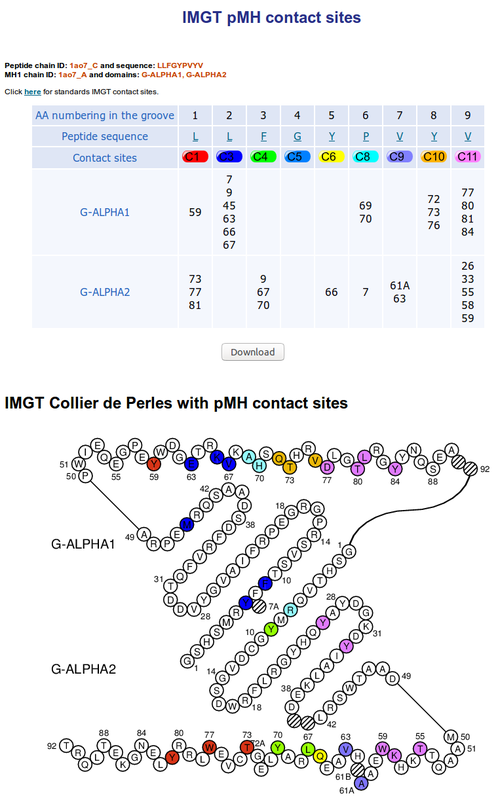 IMGT pMH contact sites provide IMGT Collier de Perles for G-DOMAIN with identification of the eleven IMGT contact sites for the standardized analysis of the peptide/MH contacts 7. The user can also download the table. The download contains two files. The first one provided chains details on a text file and the second one is the contact table on csv format. The IMGT/3Dstructure-DB Domain contacts (overview) analysis provides information on the contacts between domain and/or chain and on the internal contacts in an IMGT/3Dstructure-DB entry. The domain/chain partners considered are designated as 'Set 1' and 'Set 2'. The number of residue contacts, the number of residues involved (total and per partner 1 and 2) and the number of atom contact types are provided. Clicking on "DomPair" gives access to the 'IMGT/3Dstructure-DB Domain pair contacts of the selected pair of partners. 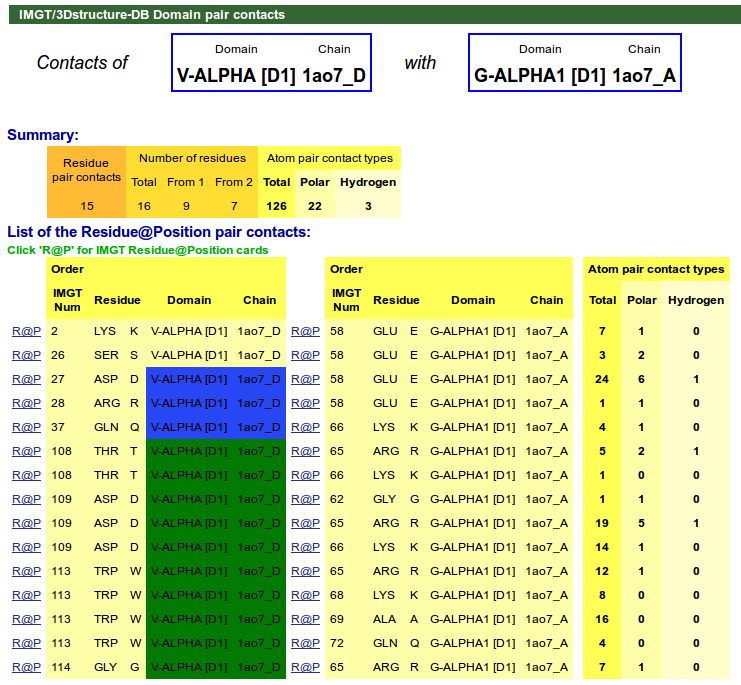 IMGT/3Dstructure-DB Domain pair contacts provides information on the contacts between a pair of partners (indicated at the top of the page). Clicking on R@P gives access to the IMGT Residue@Position card (4.2.1 section). For TR/pMH complexes, IMGT pMH contact sites are available in IMGT/3Dstructure-DB Domain pair contacts. A Residue@Position is a residue at an IMGT position, according to the IMGT unique numbering. General information comprises the PDB file numbering, the IMGT file numbering, the residue full name and formula. Residue IMGT LocalStructure@Position comprises secondary structure, Phi and Psi angles and accessible surface area (ASA in square angstrom) given by the STRIDE program. Pair contacts provides the atom contacts number, type and atom contact categories for this residue with others. Clicking on the IMGT numbering gives access to the Residue@Position cards of these residues. Epitope description of IG/antigene, TR/peptide and TR/MH are provided. The MH/peptide interface is also provided in this section. Epitope type: Discontinuous or linear. Residues: Residues which belong to the epitope order as in the AA sequence and without taking into accout spatial positions. 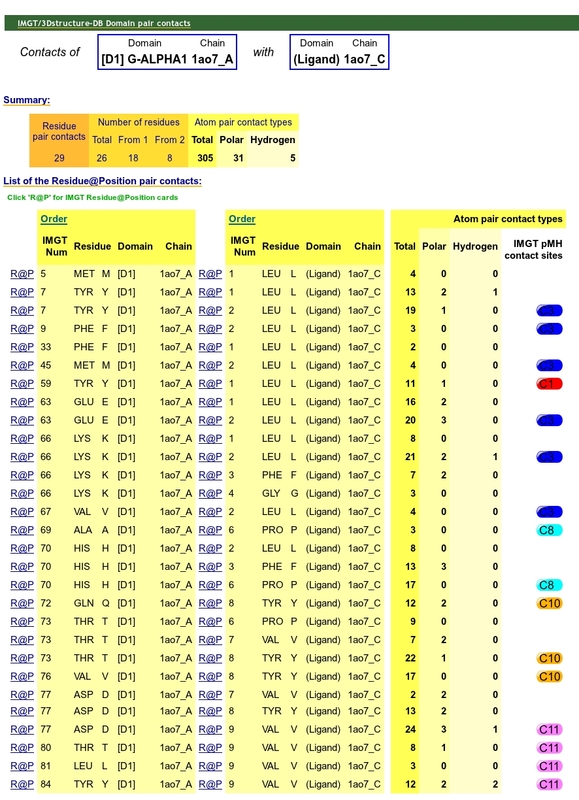 With positions: Identify the positions with chain and IMGT unique numbering of the residues implicated in the interface/epitope. IMGT paratope and epitope representations are also provided and display the amino acids implicated in pMH and TR/pMH complexes. The amino acids are shown as tables and in IMGT Colliers de Perles. The whole chain sequences are displayed in a box, indicating the chain ID, the IMGT Receptor description and the lenght of the chain. Users just have to click on a residue in sequences to visualize it in the Jmol applet (wireframe by default). Users can view structures/molecules using a Jmol applet. The interface is composed of 5 sub-menus: Selection, View, coloration, IMGT and Paratope/epitope. Receptor type, Chain ID, Domain description and CDR type are linked select elements. Linked select elements are two or more selects, where choosing a value in one changes the available values in some of the rest. For example, selecting an IMGT receptor type will updates the 'Chain ID' select to only contain Chain ID from the IMGT receptor type selected. In the same way, selecting a Chain ID will updates the 'IMGT domain description' select to only contain domain descriptions from the Chain ID selected. 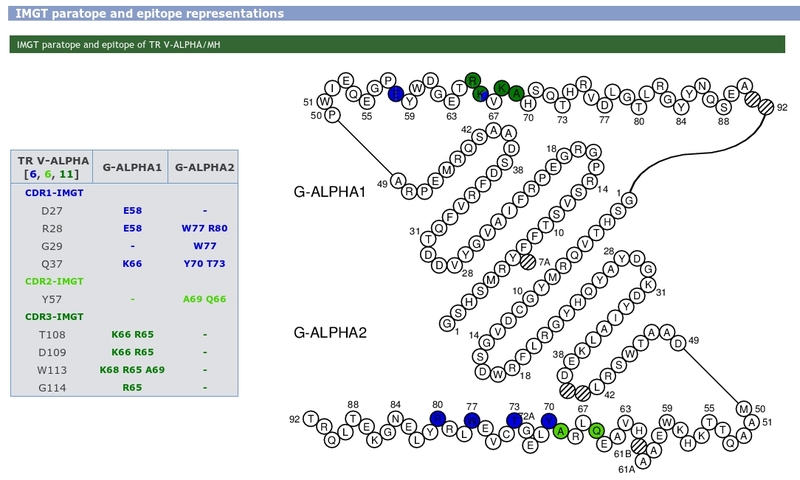 The Paratope/epitope menu offers visualization of the different amino acids implicated in the choosen complex. Allows to view (or download) an IMGT coordinate file renumbered according to the IMGT unique numbering. 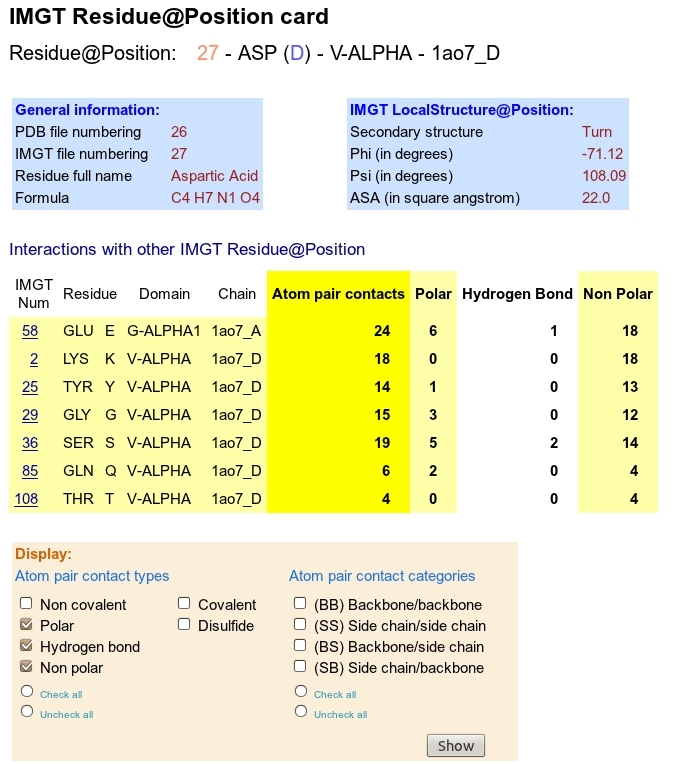 In the IMGT coordinate file the 'REMARK 410' lines which have been added provide IMGT specific information (IMGT molecule name, IMGT receptor description and chain codes), domain positions (with CDR-IMGT length for V type domains) and regions position and allele identification. For Windows users, the gziped renumbered coordinate file is automatically unziped by the system. You just have to remove the .gz extension. Related IMGT/3Dstructure-DB cards: Links to other IMGT/3Dstructure-DB entries which have a PDB bibliographical reference in common. External Links: Links to other structural databases for this coordinate file. IMGT/3Dstructure-DB contains 2246 entries (1820 PDB, 81 INN and 345 Kabat). Addition of sequences from Kabat. Amino acid sequences from Kabat were entered in IMGT/2Dstructure-DB. They comprise those of immunoglobulin superfamily sequences collected and manually culled from the scientific literature, especially the book "Sequences of proteins of immunological interest, Vol.I and II", U.S. Department of Health and Human Services, National Institute of Health. Update of the IMGT domain reference directory from the IMGT/GENE-DB database (Homo sapiens, Mus musculus, Oryctolagus cuniculus, Oncorhynchus mykiss, Rainbow trout and Rattus norvegicus) and from IMGT/HLA-DB database. IMGT/3Dstructure-DB contains 1881 entries (1800 PDB and 81 INN). Update of Web interfaces for IMGT/3Dstructure-DB database. Improvement of the Web interface and the display of results. 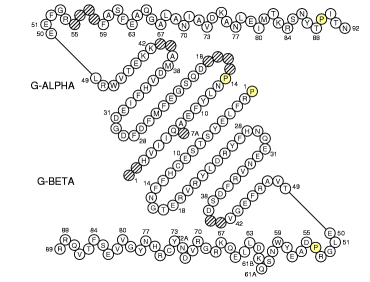 Highlight of the amino acids changes between the closest germline V-REGION (for 'V'), C-DOMAIN (for 'C') or G-REGION (for 'G') and the sequences submitted by users. for V-REGION: CDR-IMGT lengths, Number of different AA in CDR-IMGT (CDR3 not included), FR-IMGT lengths, Number of different AA in FR-IMGT, Number and list of AA changes. for C-DOMAIN: Number of different AA in strands, turns and loops; Number and list of AA changes. for G-REGION: Number of different AA in strands, turns and loops; Number and list of AA changes. IMGT Colliers de Perles on one layer and IMGT Colliers de Perles on two layers (with and without AA changes). IMGT/3Dstructure-DB contains 1855 entries (1775 PDB and 80 INN). Update of the IMGT domain reference directory from the IMGT/GENE-DB database (Mus musculus, Oryctolagus cuniculus, Oncorhyncus mykiss and Danio rerio) and from IMGT/HLA-DB database. IMGT/3Dstructure-DB contains 1835 entries (1765 PDB and 70 INN). Update of the IMGT domain reference directory from the IMGT/GENE-DB database (Homo sapiens, Mus musculus and Rattus norvegicus) and from IMGT/HLA-DB database. IMGT/3Dstructure-DB contains 1753 entries (1698 PDB and 65 INN). Update of Web interfaces for IMGT/3Dstructure-DB database and IMGT/DomainDisplay, IMGT/DomainGapAlign, IMGT/Collier-de-Perles and IMGT/StructuralQuery tools. Update of the IMGT domain reference directory from the IMGT/GENE-DB database. Addition of 163 Rattus norvegicus IGKV genes and alleles (136 functional, 6 ORF and 21 pseudogenes). Highlight of the amino acids changes between the closest germline V-REGION (for 'V') or C-DOMAIN (for 'C) and the sequences submitted by users. Results summary (corresponding to the closest genes and alleles) with: CDR-IMGT lengths, Number of different AA in CDR-IMGT (CDR3 not included), FR-IMGT lengths, Number of different AA in FR-IMGT, Number of AA class changes and List of AA class changes. Update of 3D visualization with Jmol. The interface is now composed of 5 sub-menus: Selection, View, coloration, IMGT and Paratope/epitope. Please go to 3D visualization with Jmol for more details. IMGT/3Dstructure-DB contains 1655 entries (1616 PDB and 39 INN). Update of the IMGT domain reference directory from the IMGT/GENE-DB database (Canis lupus familiaris). New tab for IMGT/2Dstructure-DB entries (INN): INN definitions. This tab contains informations about CAS number, Molecular formula, Glycosylation sites positions and Disulfide bridges positions. IMGT/3Dstructure-DB contains 1609 entries (1570 PDB and 39 INN). Addition of amino acid sequences from INN/WHO. Amino acid sequences from INN/WHO were entered in IMGT/2Dstructure-DB, a section of IMGT/3Dstructure-DB. They comprise those of monoclonal antibodies (IG, mAb) and fusion proteins for immune applications (FPIA). Upgrade of Jmol (11.6.6 version). Update of the IMGT domain reference directory from the IMGT/GENE-DB database (Homo sapiens, Mus musculus, Rattus norvegicus and Oryctolagus cuniculus). Addition of Sequence in IMGT format link in the IMGT/3Dstructure-DB card, section 'Chain sequence'. Upgrade of Jmol (11.4.6 version). Update of the IMGT domain reference directory from the IMGT/GENE-DB database (Homo sapiens, Mus musculus). Update of the IMGT domain reference directory from the IMGT/GENE-DB database. Improvement of the IMGT/DomainDisplay web interface. 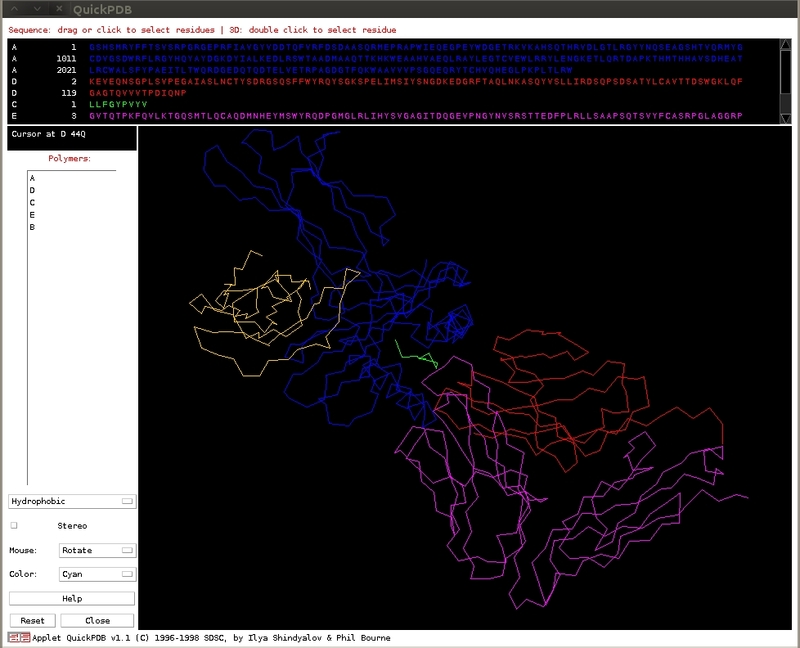 Visualization of Paratope and epitope in a separate tab. Contacts available for all residues of Paratope(s) and epitope(s). Addition of Sequence in FASTA format link in the IMGT/3Dstructure-DB card, section 'Chain sequence'. MH1-ALPHA-LIKE receptor description in RPI receptor type (and not MH). Default alignment of alleles * 01. Fixed alignments (deletion of gaps) for MR1 and EPCR genes. 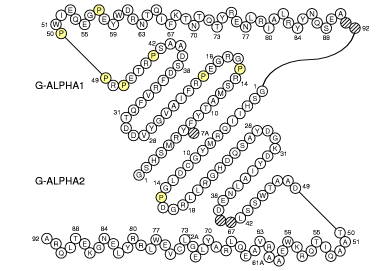 Deletion of H2-M4, M7-H2, H2-T10 H2-T24 and H2-PA genes. New option available for display results: Gene(s) and Allele(s). Modification of the IMGT/3Dstructure-DB Query page. Options available for search by receptor type (MH1, MH2) and by receptor description (FV, SCFV, FAB, FC and MH1-ALPHA-LIKE). Modification of the IMGT/DomainDisplay Query page. Options merged for the IMGT/DomainDisplay query page. Modification of the IMGT/DomainGapAlign Query page and results. IMGT/DomainGapAlign displays amino acid sequences with IMGT gaps and, for 'V', with delimitations of the FR-IMGT and CDR-IMGT, according to the IMGT unique numbering for V-REGION and V-DOMAIN, and for 'C', with delimitation of the strand and loops, according to the IMGT unique numbering for C-DOMAIN. Clicking on the button "IMGT Collier de Perles" gives access to the IMGT Collier de Perles on one layer. The first gene identification of the human IG proteins were carried out during a stay in the Laboratoire d'ImmunoGénétique Moléculaire, IGH, CNRS, Montpellier, France, by Dr. Gunilla Norhagen and Dr. Per-Erik Engstrom (May 1998) from the Huddinge University Hospital, Karolinska Institute, Huddinge, Sweden, Dr. Oksana Kravchuk (April-May 1999) from the Research Centre for Medical Genetics, Russian Academy of Medical Science, Moscow, Russia, and Dr. Olga Posukh (April-July 1999, July-October 2000) from the Institute of Cytology and Genetics, Siberian Branch of the Russian Academy of Science, Novosibirsk, Russia.